Pull the day/night lever toward you to reduce glare from the headlights of the vehicles behind you during night driving. For the details, refer to the Blue Link® Owner’s Guide, navigation manual or audio manual. The audio manual is in this section. 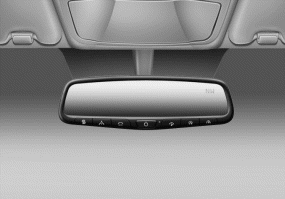 Your vehicle may be equipped with a Gentex Automatic-Dimming Mirror with a Z-Nav™ Electronic Compass Display and an Integrated HomeLink® Wireless Control System. 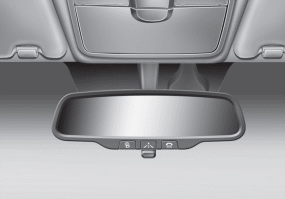 During nighttime driving, this feature will automatically detect and reduce rearview mirror glare while the compass indicates the direction the vehicle is pointed. The HomeLink® Universal Transceiver allows you to activate your garage door(s), electric gate, home lighting, etc. 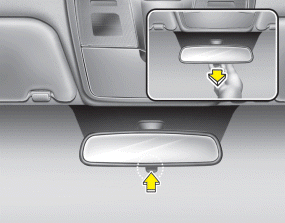 The NVS® Mirror automatically reduces glare during driving conditions based upon light levels monitored in front of the vehicle and from the rear of the vehicle. 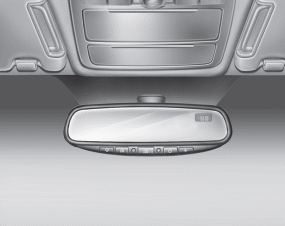 These light sensors are visible through openings in the front and rear of the mirror case.Any object that would obstruct either light sensor will degrade the automatic dimming control feature.